County Championship games are seldom associated with the term “excitement”, but when the two come together, they often create ripples that are very, very strong. The residents at Taunton had the chance to witness such a situation yesterday evening, as Keshav Maharaj's heroics led opponents Somerset to a downward spiral from the path of victory to what eventually ended up as a tie, of all results. 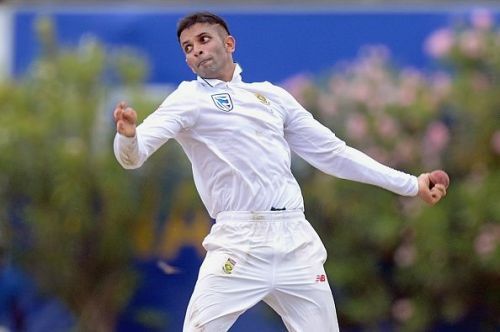 Maharaj has been consistent for South Africa over the past one year, and in the recent Sri Lankan tour where all the other bowlers failed to create an impact, Maharaj remained the exception. Although a part of it was due to playing in the spin-heavy Sri Lankan grounds, that does not take away anything from his stellar efforts. He even picked up nine wickets in a single innings in one of the Tests in the series. He has now been a part of Lancashire cricketing circles for around a month, turning in some decent spells for his side. However, the best of it so far would undoubtedly be the game with Somerset yesterday. The Somerset-Lancashire match turned out to be a low-scoring endeavour. Batting first, Lancashire made just 99 before they were disbanded completely, chiefly by Overton and Leach. In reply, Somerset concluded at 192 runs, in an innings where Maharaj picked up four scalps. Lancashire hoped of a relapse in the second innings but failed to do much as Leach ran riot again. The player added seven more wickets into his first innings' tally of five, to end with 12 wickets from the game. Lancashire's innings ended at 170, giving Somerset an easy winning chance – with a target of just 78. Maharaj, though, had other ideas, as he started executing his plans right from the very outset, having been assigned the new ball. He simply ripped apart the Somerset lineup, returning with figures of 7/37 as the opponents crumbled to 77 all-out – one solitary run short of a win, also implying a tie. The last wicket also belonged to the Protean left-armer. Maharaj's efforts produced the first tie in the County Championship in over 15 years. He was also man-of-the-match, for total match-figures of 11 wickets for just 102 runs.